This is the sword you get after defeating Wandering Vindicator. You won't loot it off him, instead he will become friendly and tell you to take his sword which rests upon the stone. The stone is right next to him. Just got this item and it rolled Epic, so it is obviously being affected by the quest loot upgrading system brought in for Warlords. 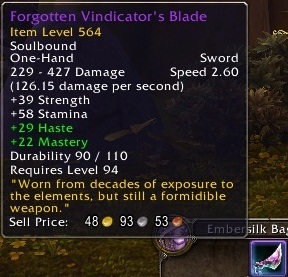 When I equip this item over a 536 item, my average ilvl drops by 34 levels. I got this item today on my Warlock. I went to disenchant this item and was COMPLETELY shocked when it disenchanted into a Sha Crystal! I don't know if it being upgraded to an Epic confused the game or what, but I sent a bug report to Blizzard informing them of the issue. I just wanted to post this here so if it happened to anyone else, they wouldn't be shocked. Anyone else having issues of not being able to loot this after killing him, even though it sparkles? Requires: level 94 to loot. "Die Jahrzehnte, die es den Elementen ausgesetzt war, haben ihre Spuren hinterlassen, doch es ist immer noch eine beeindruckende Waffe."